It is covered with warts. The head is flat, with a protruding nose, and up to a dozen barbells in the chin area. The dorsal skin parts are brown or grey with bits of brown while the ventral skin parts are pale gray. Dorsal side of the neck and mouth can be creamy yellow or bone white. Unlike the oblong carapace of adults, the carapace of juveniles is pear shaped when viewed from above. It is either grey or brown with dark spots all over its surface and a yellow rim at the outer edge of the marginal scutes. The plastron of hatchlings is black or steel gray, the ventral parts are yellow, beginning under the distinctive snout and extending along the neck to the body cavity. (Cann, 1998) The dorsal skin parts are gray except for the head which can have yellow tinge. There is a division through the eye, a character which can be seen in some Emydura or Elseya species, but not in other Chelodina or Macrochelodina species. The species has musk glands which are used to exude a yellow, strong-smelling, liquid when a specimen feels to be in danger. (Bradsell et al., 2002) C. oblonga is the only species out of the Chelodina and Macrochelodina genera to have well developed neural bones forming a contiguous series (Thomson & Georges, 1996). It was thought the Australasian Chelidae had no neural bones until Burbidge et al. (1974) reported neurals as a consistent feature of Chelodina oblonga. Females are larger with shorter tales while males have a concave plastron, shallower carapace and a longer and thicker tail. 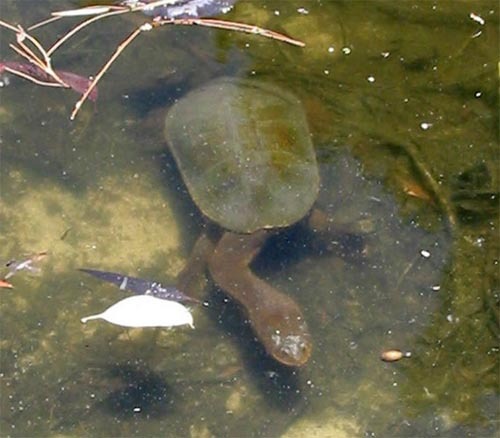 Chelodina oblonga lives in lakes and lagoons in the south-west of Western Australia. Its distribution ranges from the Hill River in the north, down south to the Blackwood River, and further east to the Susetta River (Fitzgerald River National Park). (Cann, 1998) At some places, the species can occur in sympatry with Pseudemydura umbrina, Siebenrock, 1901. The south-west of West Australia is notable for its many estuaries with intermittent (sand-barred) connections to the sea and for its thousands of freshwater (and many salinised) lakes, swamps and damplands. Many of these waters are inhabited by Chelodina oblonga which lives in lakes, lagoons and some rivers. What's more, the species is known to tolerate, but only for short periods, brackish and even saline water with salinity levels as high as 13 200 mg/L. 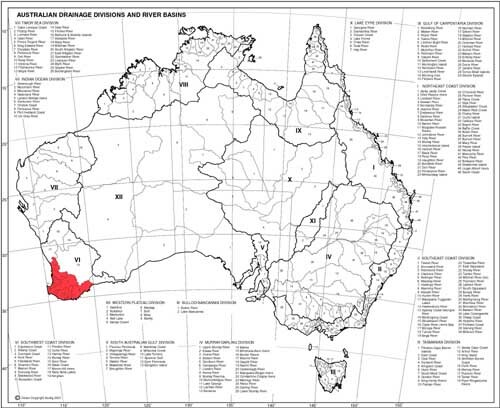 (Chapman and Newbey, 1995) The waters inhabited by C. oblonga include Thomson Lake, Bibra Lake, Perry Lakes, Lake Monger, Blue Gum Lake, Booragoon Lake, Piney Lake, Little Rush Lake, Yangebup Lake, Kogalup Lake, Bangenup Lake, and many others. The south-west of Western Australia has a Mediterranean climate, with warm to hot dry summer and cool wet winter. February is the hottest month of the year with an average maximum temperature of 30.0°C while July is the coolest month with an average maximum of 17.4°C. Mean minimum temperatures range from 9.0°C in July to 18.1°C in February. Average annual rainfall is about 800mm. Most of the precipitation occurs from May to September. The period from November to April is hot and dry. As a result, many water bodies dry out and some C. oblonga specimens aestivate by burying themselves in the drying mud for 5-6 months. (Kuchling, 1988, 1989) Other specimens prefer to search for a permanent water body. The temperature at the waters inhabited by C. oblonga ranges between 18°C in summer (south hemisphere time) to 25-26°C in winter. For example average water temperature at Booragoon Lake is 22.6°C in February to March and 20°C in September to October. The highest recorded water temperature is of 29.5°C. (Fox et al., 2004) As for the pH, a study of 41 wetlands on the Swan Coastal Plain, which contains a lot of lakes inhabited by C. oblonga, found that the majority were alkaline, with a pH greater than 7. (Fox et al., 2004) In captivity, the species should be kept within the pH range of 7.0 to 8.5. Adults of C. oblonga are also subject to predation with the introduced red fox (Vulpes vulpes) acting as the main predator.